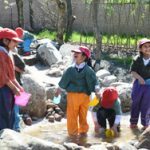 When approached by a school to create a forest stream on a grassy embankment, the challenge was set! 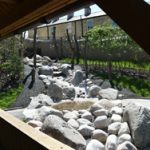 We needed to provide a waterproof base and associated water supply and recirculating pump, this all came together with 25 Tonnes of glacial boulders, pebbles and creativity form our in house team of contractors. To give the ‘established’ look our Landscape Architect came up with the idea of including tree stumps concreted in the ground. 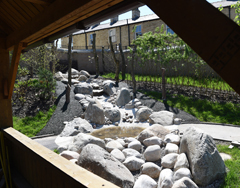 This was to give the impression of a mature forest when looking into the stream, we think it works and the the school even see garden birds in the playground as a result. 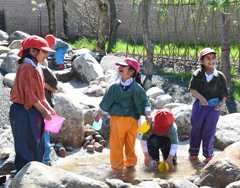 The concrete pools create a series of splash pools, ideal for dam building and experimenting with play and water.